Tobagonian ancestry in the United States is relatively small yet rapidly growing. About 2.5 million people reported Ethiopian, Nigerian, Haitian, Jamaican, or Trinidadian and Tobagonian ancestry in the 2008–2012 ACS, or around 0.8 percent of the total U.S. population. The population in these selected ancestry groups increased by about 2.1 million between 1980 and 2008–2012, or about 469 percent. The geographic distribution of these groups varied considerably, owing to the distinct migration and settlement history of each group. The population with Jamaican ancestry was the largest of the five selected groups, although it was the slowest growing, adding about 744,000 people between 1980 and 2008–2012, an increase of about 294 percent. The population of Haitian ancestry had the largest numeric change over the same period, with an increase of about 777,000 (862 percent). but was also the fastest growing from 1980 to 2008–2012, growing by around 2,400 percent. states of Florida (47 percent of the total U.S. Haitian population) and New York (22 percent of the U.S. total). Florida has a climate similar to Haiti’s, and Miami is the closest major U.S. city to Haiti. New York is a global city and has historically drawn many immigrants. There were lesser concentrations of people reporting Haitian ancestry in Massachusetts (8 percent), New Jersey (7 percent), and Georgia (3 percent). pattern, with high concentrations in Florida (26 percent of the U.S. Jamaican population, and 15 percent of the U.S. Trinidadian and Tobagonian population) and New York (31 percent of the Jamaican population and 46 percent of the Trinidadian and Tobagonian population). Noticeable concentrations (greater than 1 percent) of these two groups were also found in Virginia, North Carolina, Texas, and California. during and after World War I, and by the existence of a thriving Black community, especially in Harlem. New York’s service economy also meant that there were relatively many jobs available. the largest percentage of Nigerian ancestry population. The geographic distribution of the Ethiopian ancestry group was chiefly a result of refugee resettlement efforts by government and nongovernmental organizations, as well as later internal migration for family reunification and job opportunities. from a handful in the 1920s to thousands by the 1970s. Usually these individuals returned to Ethiopia after completion of their education. The 1974 revolution in Ethiopia made it difficult for many of the Ethiopian students, business leaders, government officials, and other temporary visitors who were already in the United States to return to their country of origin. They became the first wave of Ethiopian immigrants. The next wave included those who came starting in the 1980s as refugees, as well as victims of famine and drought. They also came because of the efforts of international and U.S. organizations such as the Lutheran Church, which had a relationship with Ethiopians that dated back to the late 19th century. These post-1970s migrants had a more diverse socioeconomic background compared with the first wave, many of whom shared more of a privileged past. Corps, oil trade, and college recruitment. American higher education grew more popular in comparison to the British and other European models to which Nigerians had been accustomed due to their prior experience of British rule. Most students came to acquire an education and eventually returned home. This pattern changed during the Nigerian civil war (1967 to 1970). Many Nigerians in the United States chose not to return to their country. They and others who left the country formed the first wave of Nigerian immigrants. of students for undergraduate and advanced studies in the United States. Other students came with the financial support of their family or community, all indicative of the economic prosperity of the country and the high premium placed on education during this period. unable to leave the United States. These students as well other Nigerians who could afford to leave the country formed the next wave of immigrants to the United States. Although there had been successive waves of migration by people of Haitian ancestry to the United States during the Haitian revolution (1791 to 1804) and the American occupation of Haiti (1915 to 1934), the majority arrived beginning around 1957—when migration to the United States was encouraged, following political and economic change in Haiti. Prior to that time, emigration flows from Haiti were primarily to France, former French colonies in Africa, and the Frenchspeaking parts of Canada. An additional wave of Haitian migrants came to the United States around 1964. The 1965 Immigration Act allowed them to bring close relatives in the late 1960s and 1970s. Many Haitians migrated to the United States in the late 1970s and early 1980s due to political and economic conditions in Haiti. The initial migratory flows for people with Jamaican and Trinidadian and Tobagonian ancestries were to other territories in the Caribbean such as Guyana, Cuba, and the Dominican Republic, as well as to Central America, Panama, and Britain. Western Hemisphere during this period. wave of Jamaicans and Trinidadians and Tobagonians between the mid-1920s and 1965. In spite of restrictive immigration policies, Jamaicans and Trinidadians and Tobagonians were still able to enter the United States as British colonial subjects. other parts of the Caribbean These immigrants, particularly from Jamaica, tended to be skilled workers who looked abroad for expanded opportunities. 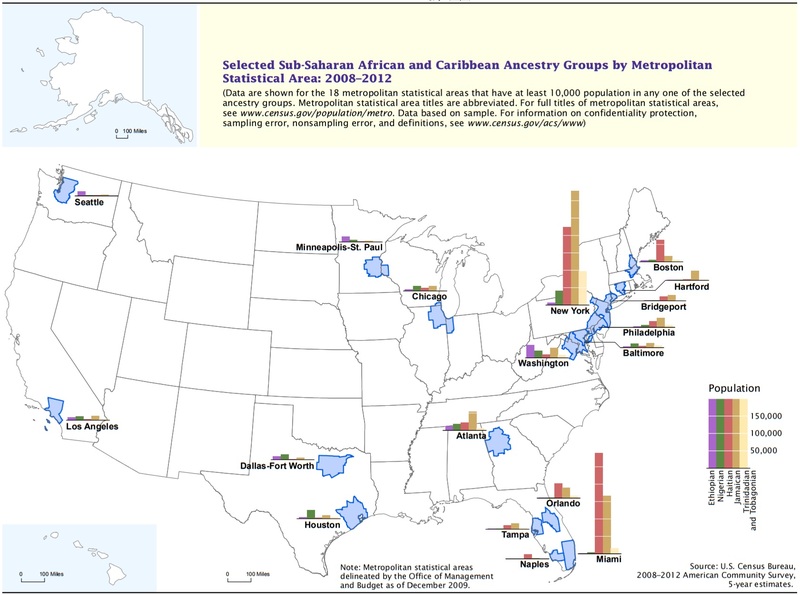 As shown in Figure, there were 18 metropolitan statistical areas (metro areas) with at least 10,000 population in one or more of the selected ancestry groups based on the 2008–2012 ACS. While some metro areas (e.g., New York and Atlanta) had sizeable populations in three or four of the selected groups, others (e.g., Minneapolis and Seattle) had only one group with 10,000 or more population. Among the largest concentrations of the selected ancestry groups were the population of Jamaican ancestry in the New York metro area (330,944) and the population of Haitian ancestry in the Miami metro area (291,963). The New York metro area also had a large population of Haitian ancestry (226,294); the Miami metro area also had a large Jamaican population (167,208). None of the other selected ancestry groups had a population of 100,000 or more in any metro areas. Among the selected metro areas, the largest population of Trinidadian and Tobagonian ancestry was in New York (97,270), as was the largest population of Nigerian ancestry (40,549). The largest population of Ethiopian ancestry was in the Washington metro area (37,924).